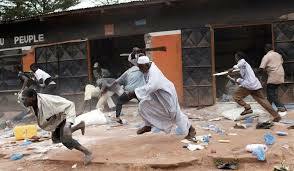 In Taraba state, the Fulani Herdsmen have continued to terrorise the people and continued the killings with impunity. No fewer than four Tiv villagers were killed in Ngutswen village, near Wurojam in Gassol Local Government Area of Taraba State, barely 9 hours after Governor Darius Ishaku raised alarm over a plot to attack the state by Fulani herdsmen. Ishaku had on Thursday while playing host to the National Working Committee of the People’s Democratic Party, led by the National Chairman, Prince Uche Secondus, said he received notice of an attack on the state which, according to a letter he received from an undisclosed source, would happen within 10 days. Speaking to journalists at the site of the burial of the four victims of the attack in Ngutswen village, a community leader, Mr. Tyav Ngutswen, said his people were sleeping when the Fulani herdsmen struck in the village at about 10:09 pm. “We caught 12 of their cows that eat our crops and handed over to them peacefully, but we demanded a compensation of N40,000 which they reluctantly paid, but threatened to attack us. “I can confirm to you that among the over 20 of them (herdsmen), that attacked us, Alhaji Buruti’s sons were among them. “We can’t stay here because there is no security, that’s why we are rushing to conduct the burial and leave before it gets dark,” he said.